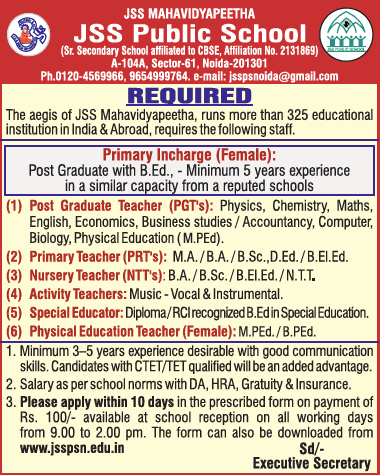 JSS Public School Noida has advertised in THE TIMES OF INDIA newspaper for the recruitment of Teachers PGT / PRT / NTT / PET jobs vacancies. Interested and eligible job aspirants are requested to apply within 10 days from 23rd January 2019. Check out further more details below. About School: The JSS Public School is a day school which follows the curriculum laid down by the Central Board of Secondary Education (CBSE), New Delhi. As a learning enablers, it pledge to offer the highest quality educational programmes by blending education with modern pedagogy and an environment conducive to learning which fosters the all round development of the child. The school offers a well balanced and broad curriculum with emphasis on creativity and excellence through various curricular, extra curricular and sports activities. At JSSPS, each student is encouraged to develop leadership qualities along with interpersonal and intrapersonal skills. 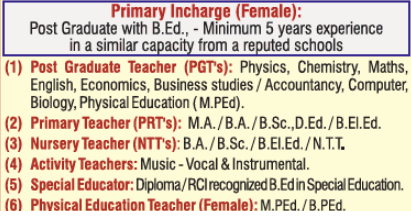 How to Apply: Interested and eligible candidates are requested to apply in the prescribed format available in the school reception at the following address. Application can also be downloaded from school website.